Glazed tiles all over the place! That was the first thing that struck me when entering the Citadel. Not only the common Chinese yellow roof tiles, but also a kind of porcelain mosaics that I had never encountered before - fragments of blue & white vases that have been put together to form new designs on the outer walls of buildings and gates. The Citadel is a pleasantly quiet place to walk around for a couple of hours. It's a very busy site near the entrance gate, but I was almost on my own at the back of the complex and at the fringes. My favourite building here was the Truong San Residence, with its great yellow entrance gate. This and most of the other objects look very recently painted and/or restored. Over-restored maybe, I wonder what our Forum would have to say about this one. A visit to the Hué monuments is not complete without seeing some of the places outside the city. For that I rented a bicycle and set off south. The first kilometers out of Hué are easy going. Every 10 minutes or so there's an interesting stop - I visited Nam Giao esplanade, heard the monks chanting at the very peaceful Tu Hieu pagoda and joined the busloads of tour groups again at the Tomb of Tu Duc. There is a "Tomb" here (though empty), but it actually was more of a country house & pleasure park for the emperor. It still is a grand place which takes about an hour to visit. After that I had planned to visit some more tombs. But the road quickly deteriorated, the signposting got more erratic, the sun warmer and the hills higher. At one moment I even found myself and my bicycle on the very dusty AH1 highway between Hanoi and Saigon. When I encountered a turn with a sign "Hué 10 kms", I quickly decided to turn back and be pleased with the things I had managed to see that day. The Imperial City is probably the only good reason to visit Hue - but it's worth it for this site alone. It's a large complex and I spend a few hours walking around and seeing all the different sections of it. I didn't have a guide and, in retrospect, I regret that. You would probably get a lot more out of it if you had someone explaining the finer details. Still, you can see a lot on your own and it's not just the scale of the site but all the little details in the architecture which are interesting. Large parts were destroyed during the 'American War' and some of the buildings are now being restored or rebuilt from scratch. I think it's good that's been done from an aesthetic perspective but it seems a bit odd to have completely new structures, even if it's being done with authentic methods. On my way to Danang Airport, I looked back on the past few days I spent in the former capital of Imperial Viet Nam, Hue, which in my opinion, one of the great cultural city that actually should be on the same league with Beijing, Seoul or Kyoto, but after many wars and conflicts, only fragment of its glories remain. When I first saw the wall of Hue Citadel, I was really impressed as the wall is really different from other city wall I saw in other parts of Asia, a combination of Asian and French Vauban fortification design, something really unique. The flag tower is really impeccable in design and the square and pavilions next to the river are really picturesque. When I crossed the bridge to see inside the citadel, I again impressed for the design of the gate tower, simple but really elegant and when I saw the square in front of the main gate to the imposing imperial palace behind the flag tower, I said WOW immediately, for its perfect size and overall landscape design. The palace is a bit simple but still preserved the original idea of oriental palace perfectly with many unique designs that I could not find anywhere else. Then I proceeded to other parts of the palace and I found many empty spaces or ruins of destroyed buildings, only few structures are still remained. The best preserved area maybe the ancestral shrine, simple with Confucius element, a richer decorated version of Seoul’s Jongmyo Shrine; however the gate is a real highlight. Actually the best of the palace remains are its many beautiful gates. These gates are elegantly rich in decoration with mosaic of broken porcelains and glazed tiles. The recently palace restoration part is really amazing that provide an idea of how impressive the site originally was. The decayed of other buildings really made me sad of how war and neglecting effect this beautiful place; at the end I found that the site is disappointing. Fortunately the saving grace of Hue comes from other Hue’s cultural heritages in my opinion. 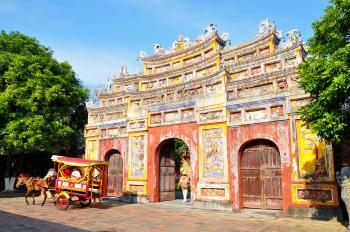 There are many temples and tombs around the city, and one of the major highlights is the tomb of Tu Duc, the fourth emperor of Hue. Originally he built this complex as his villa, after his death the complex has been transformed to be his tomb and temple, so the landscape design is really beautiful. The pond and pavilion reminded me the secret garden of Korea’s Changdeokgung Palace, ironically Korean tourists were everywhere during my visit. The tomb design itself is really unique and different from China and other East Asian countries. There is no tumulus or earth mound. Another highlight is the tomb of Khai Dinh, the 12th Emperor. This is the smallest tomb but very beautiful and different. The tomb built on many terraces, and with one single main building that used as tomb, temple and memorial hall. The design is a unique mix of western and local art, and built by concrete and marble which made the complex in the better condition. The decorations are really impressive for both exterior and interior. The walls inside the main hall are richly decorated with beautiful mosaic, glazed tiles and paintings, truly one of the must see site in Vietnam. As I mentioned above that Hue is the great cultural city that actually should be on the same league with Beijing, Seoul or Kyoto. I really wondered if there is no Vietnam War, what Hue will be looked like as even after the wars, Hue still has a lot of cultural sites to admire, really a capital of powerful kingdom in mainland Southeast Asia before colonial time. The continuing restoration project of Hue is a good thing that bring back the bygone magnificent of this city and I believe Hue will become one of the great World Heritage Site of Asia, and a must see to every travelers in the near future. 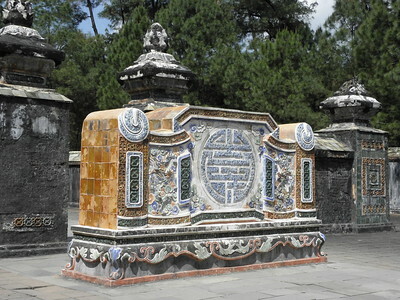 I visited the citadel of Hue and the associated tombs in february 2012. In spite of the rain, I found the place amazing, especially the Khai Dinh tomb which offered greatly decorated rooms. The best way to go to the different tombs if you have not a lot of time, is to book a tour in the city, to visit the citadel, the pagoda and the three main tombs in one day. As Els says, the tombs of Hue are widely scattered, some more than 10 kms from the city centre. But they are reachable by taxi, or by boat along the Perfume River. One that I visited was the colourful tomb of Ming Mang, where you pass through several gates and temples before reaching the actual tomb on a hillside at the rear of the complex. 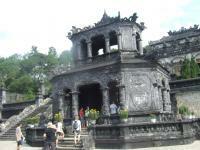 Another was the tomb of Khai Dinh, a complex of grey stone with lots of steps and elaborate stone decorations. While touring the district I also visited the tombs of Tu Duc and Duc Duc as well as the Thien Mu Pagoda. 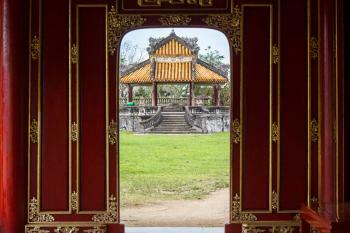 Inside Hue itself the huge Citadel, a complex of many differing styles filled a large area. The memorial house in Phan Dinh Phung Street and the An Dinh Palace were much smaller, but were all within walking distance of the city centre. Feng Shui: The new capital was planned in accordance with ancient oriental philosophy in general and Vietnamese tradition in particular; it also respected the physical conditions of the site, especially the Perfume River and Ngu Binh Mountain (known as the Royal Screen). Modelled after: Emperor Gia Long of Vietnam built a palace and fortress that was intended to be a smaller copy of the Chinese Forbidden City in the 1800s. 236 Community Members have visited.